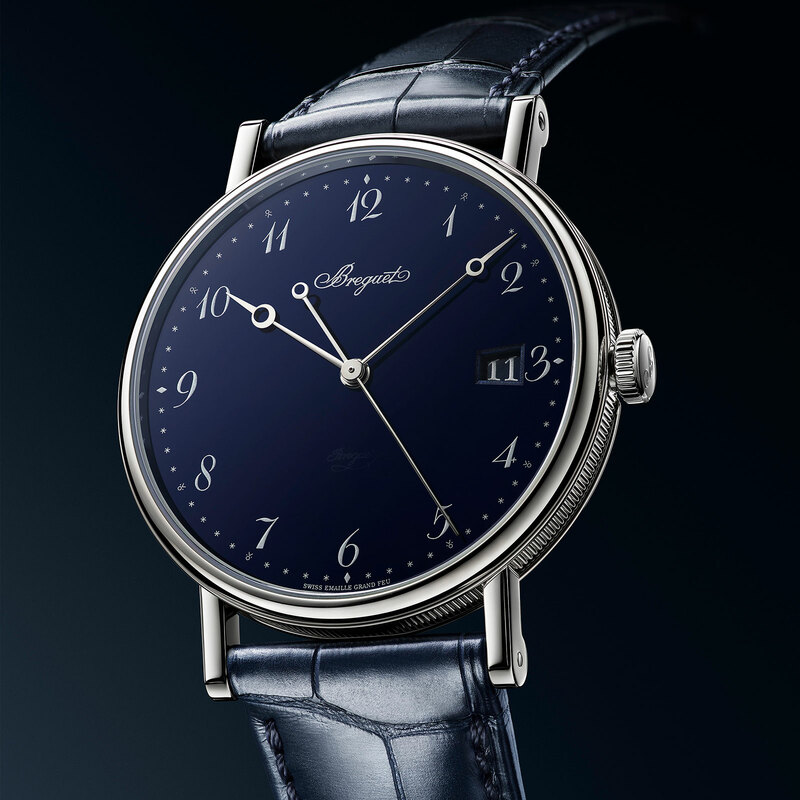 A new launch that will be shown to retailers in March and the press in May, with Breguet being out of the Baselworld trade fair, the Classique 5177 is quintessential Breguet, with a twist in the form of a vitreous enamel dial in dark blue. In its original form the Classique 5177 is a solid Breguet dress watch with silver guilloche dial, albeit one with centre seconds and a date. With the blue fired enamel dial it is elevated to another level, being both distinctly Breguet and novel at the same time. The date, unfortunately, does get in the way of its pure classicism, especially since it somewhat confusingly sits right next to the “3” hour marker. The look, however, is not new, having been used in a 10-piece limited edition to mark the reopening of Breguet’s Tokyo boutique in 2017. That was truly sublime, being the Classique 5175 model without a date window, though owners of the Ginza edition might be disappointed at the repeat of the blue enamel dial. 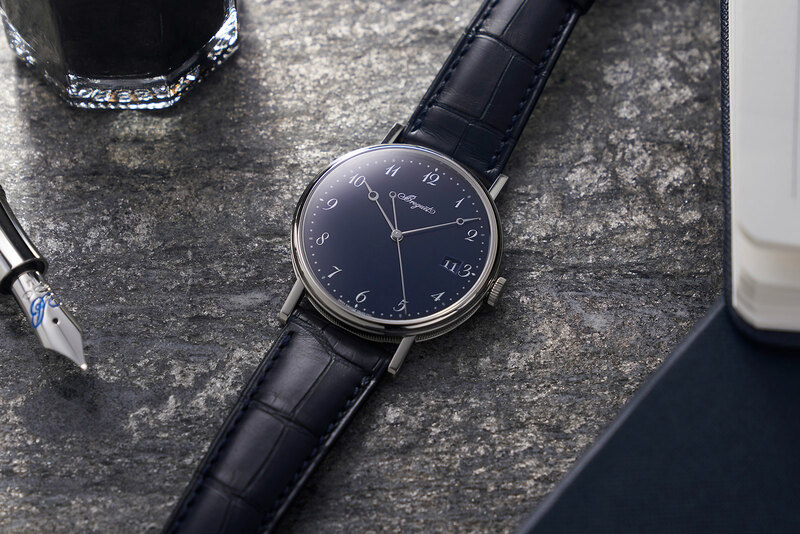 Date quibbles aside, the new Classique is a beautiful watch. 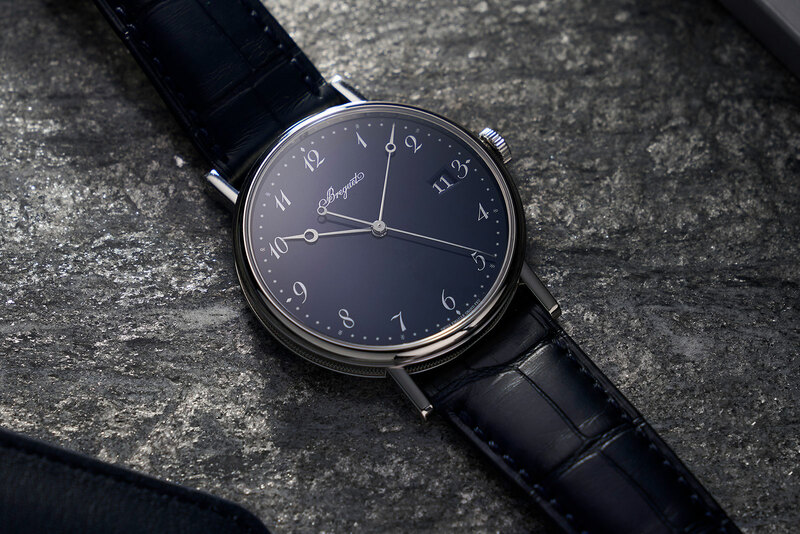 The dial is dark blue grand feu enamel – fired in an oven at 800 degrees Celsius – with markings in powdered silver, as are the numerals on the date wheel. All three hands are rhodium-plated steel. 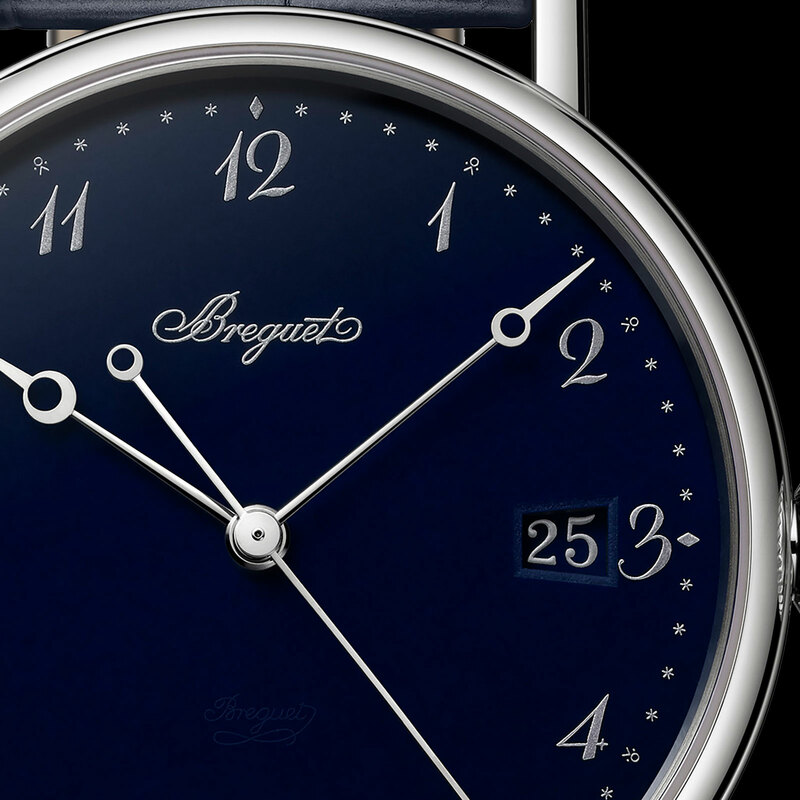 The italicised “Breguet” numerals and star minute track are inspired by antique Breguet pocket watches, as is the Breguet “secret signature” in blue enamel paint just above six o’clock. 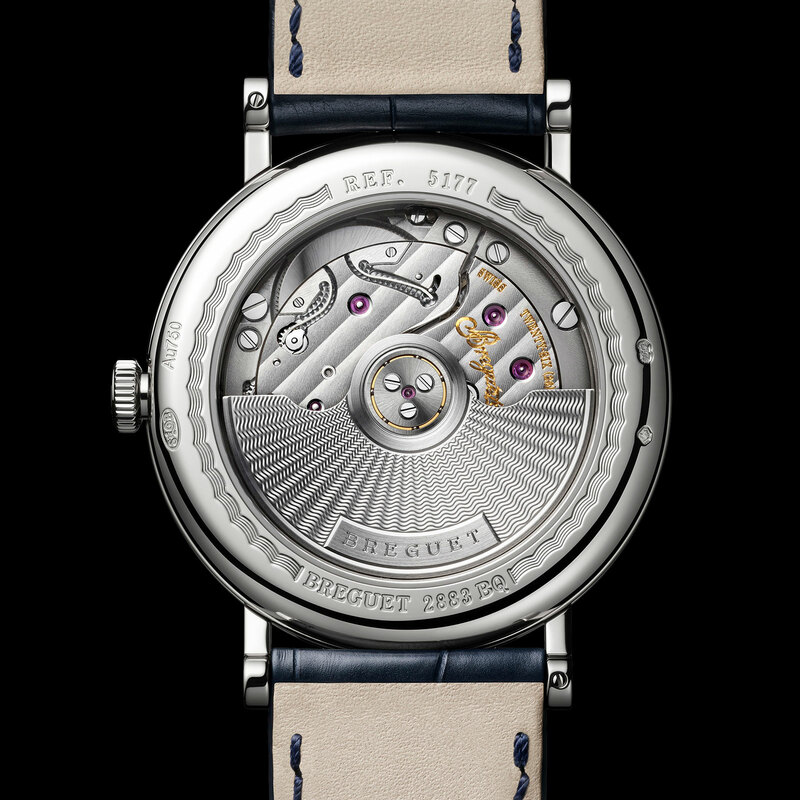 The case is 18k white gold and 38mm in diameter, featuring the fluted case band that’s a Breguet signature. Inside is the cal. 777Q, an automatic movement with a 55-hour power reserve. Its hairspring, escape wheel and pallet fork are all made of silicon, while the balance is free-sprung with four regulating weights. The cal. 777Q was created by movement maker Lemania, then Breguet’s sister company, shortly after the Swatch Group acquired Breguet and its associates in 1999. Lemania has since been integrated into Breguet, making this an in-house movement. 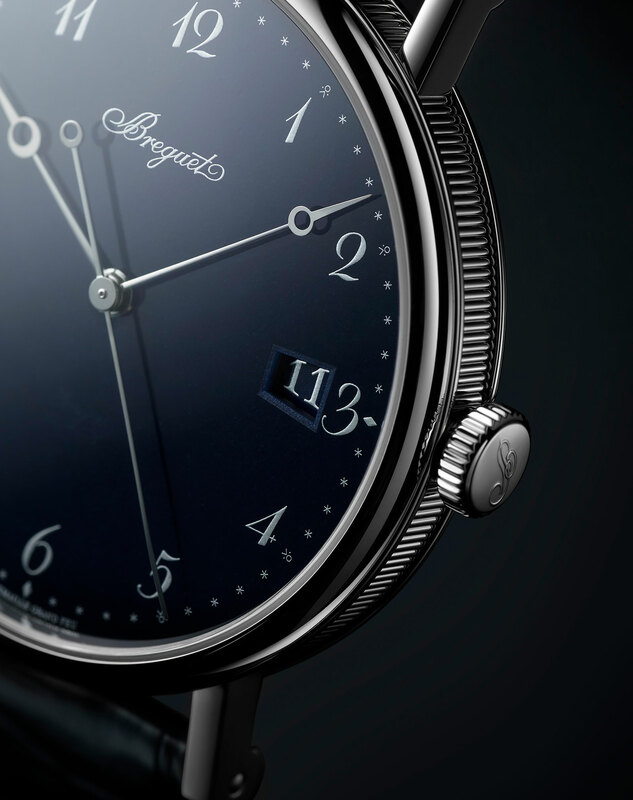 The price of the Breguet Classique 5177 in blue enamel (ref. 5177BB/2Y/9V6) has yet to be announced, but should be in the region of US$22,000 given the prices of comparable watches in the line-up. Settling the 300-Year Old Dispute – Who Invented the Balance Spring? 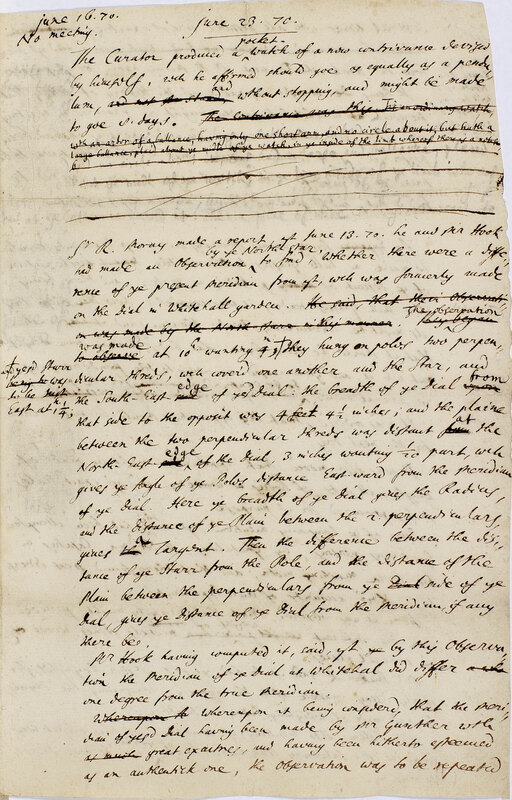 The irascible Robert Hooke and his long-lost notes. 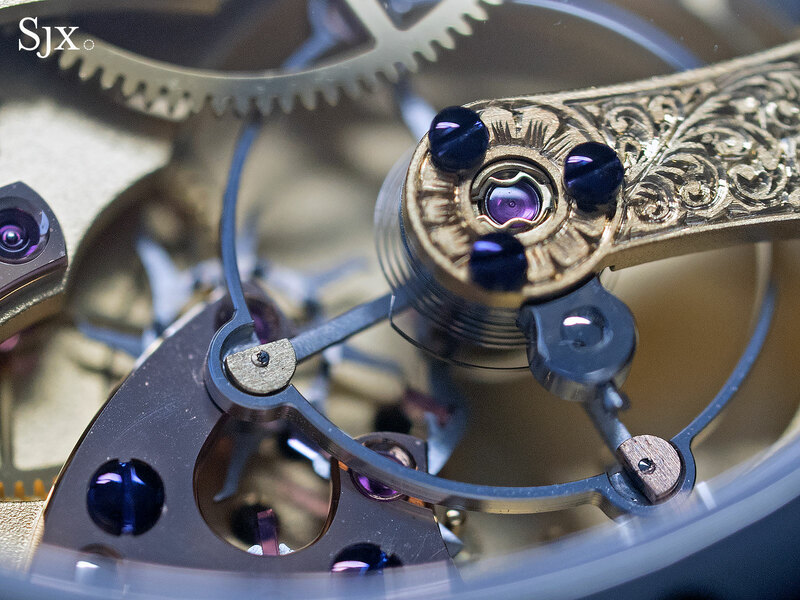 We take it for granted: the small, concentric spring at the heart of a mechanical watch, which “breathes”. Working together with the balance wheel – the two are known as the regulator – they control the escapement, which in turn creates the tick-tock of a movement. Mechanical watches are pretty much the same now as they were hundreds of years ago: a coiled spring is wound tightly and then unwinds to produce the energy necessary to power the movement. The gear train transfers power to the hands, while the escapement regulates the power output so that the measured time is precise. Modern mechanical watches do this very well, and even inexpensive, mass-produced watches keep good time. But three and a half centuries ago, when accurate time was essential for maritime navigation, accomplishing consistent good timekeeping – despite rough seas in particular – was one of the most important questions of the day, known as the problem of longitude. Wealth and influence were dependent on trade, which in turn required a fleet that would navigate accurately. That called for a timekeeper that would allow a sailor to determine his location, or longitude, precisely. The solution to the problem would thus provide fame – and perhaps fortune – to its inventor. A portable but precise timekeeper requires a metronomic regulator inside the movement that acts like a pendulum, but in a much smaller space while being resistant to the influence of the vagaries of temperature, humidity and motion. Much of the development in the field came in the 17thand 18th centuries, as clocks and watches steadily became more precise, and accurate, moving slowly towards the watch movement that we know today. A crucial development was the regulating element within the movement, namely the hairspring and balance. Its development formed a battle of reputations between two men of science with diverging characters and backgrounds: Christiaan Huygens and Robert Hooke. The story is one of vanity, intrigue, and, eventually, an almost unbelievable revelation – even as fiction the ending would be hard to believe. 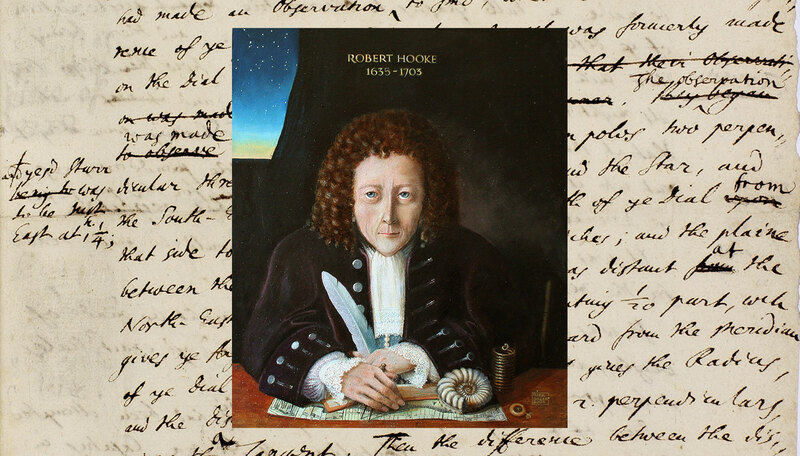 Born in 1635 on the Isle of Wight into a family of church rectors, Robert Hooke was expected to follow in the same path. But his father’s early death resulted in a bequest of £40 for education, and although the money had been intended for vocational training such as watchmaking, Hooke was able to gain a place at the prestigious Westminster School in London. From Westminster he won a scholarship to Wadham College, Oxford, under the guidance of the John Wilkins, the Warden, or principal, of the school. Wilkins was a Royalist – the country was then undergoing a civil war – and in an attempt to maintain scientific discourse despite the politic upheavals, he arranged for regular meetings during the Protectorate, a period when the United Kingdom was a republic. Those meetings were the genesis of what was to become the venerable Royal Society, where Wilkins was a founding member and Hooke eventually a fellow. Hooke made life-long friends at Oxford: architect Christopher Wren, chemist Robert Boyle, and other notables of the day, including Thomas Tompion, the foremost clockmaker of the period. 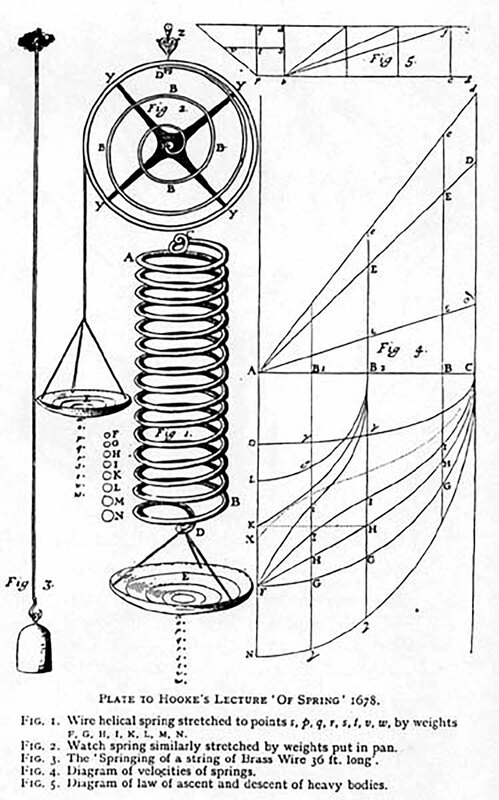 A plate from Hooke’s 1678 lecture Of Springs. Illustrious friends notwithstanding, Hooke was, by most accounts, an irascible individual; prone to arguments and accusations towards others for not showing “collegiate” behaviour, or in other words using Hooke’s work without citation. That was the spark that led to a confrontation with Sir Isaac Newton that may have led to Hooke’s relative historical obscurity, though recent research has changed that. 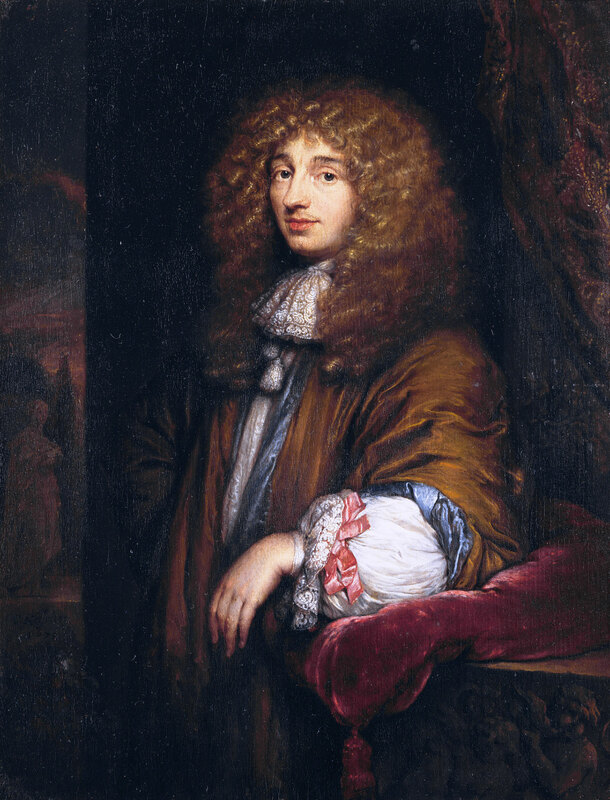 Christiaan Huygens, in contrast to Hooke, was a boy born into the gilded life. He was the son of a noted diplomat and prominent advisor to the House of Orange, which today forms the Dutch monarchy. Huygens’ father counted notables like Galileo Galilei and René Descartes as friends. Huygens demonstrated notable mathematical and scientific aptitude from a young age, talents that were encouraged by his father. The young Huygens was tutored at home by noted mathematician Jan Jansz de Jonge Stampioen, before progressing to the University of Leiden and then Orange College. The difference in the careers of Hooke and Huygens after their formal educations is equally striking. Huygens had the luxury of working from home and corresponding with some of the most important scientists of the day, including Hooke’s foe Sir Isaac Newton. And Huygens contributed significantly to, and received credit for, Newton’s second law of motion. In terms of horology, Huygens most famous work, Horologium Oscillatorium of 1673, was a major treatise on pendulum clocks. In it, Huygens details the mathematical formula for the period of an optimum pendulum. But the quest for a precise timekeeper was to solve the longitude problem, which meant a timekeeper for ships. Pendulum clocks were not the best solution as the rocking motion of the ship was not conducive to a regular swing of the pendulum. Another form of mechanical regulation was required, one that was unperturbed by a ship’s motion. In 1675 Huygens published a letter in the Journal des sçavans providing details and a diagram of a regulator formed by with a concentric spring. Hooke was reputedly incensed, insisting he had presented such an invention to the Royal Society five years earlier. He accused Huygens of stealing his idea. To prove his point Hooke went in search of the minutes of the meetings of the Royal Society. But the minutes for the relevant meeting, and in fact the weeks, months and even years around it, were missing. Suspicions were harboured and aspersions were cast. How could Huygens have known about Hooke’s invention? And where were the missing minutes? The link between Hooke and Huygens lies with Henry Oldenburg. He was the First Secretary of the Royal Society, responsible for the official minutes of the society’s meetings. But he was also foreign correspondent of the society, tasked with maintaining a network, accomplished by written correspondence, with overseas scientists, one of whom was Christiaan Huygens. Huygens’ ability at translating experimental outcomes into a theoretical form allowed him to publish the result. Although intuitively Hooke was correct, and first, formalising the conditions for the experiment allows replication, which Hooke was unable to do. Replication, unfortunately for Hooke, is the nature of science. Hooke was disconsolate and insistent he had been first. But without proof, and Huygens’ widely read letter, Hooke’s protestations were just rumour. Another 330 years would go by before the dispute was resolved. Understandably, neither Huygens nor Hooke was available for comment. 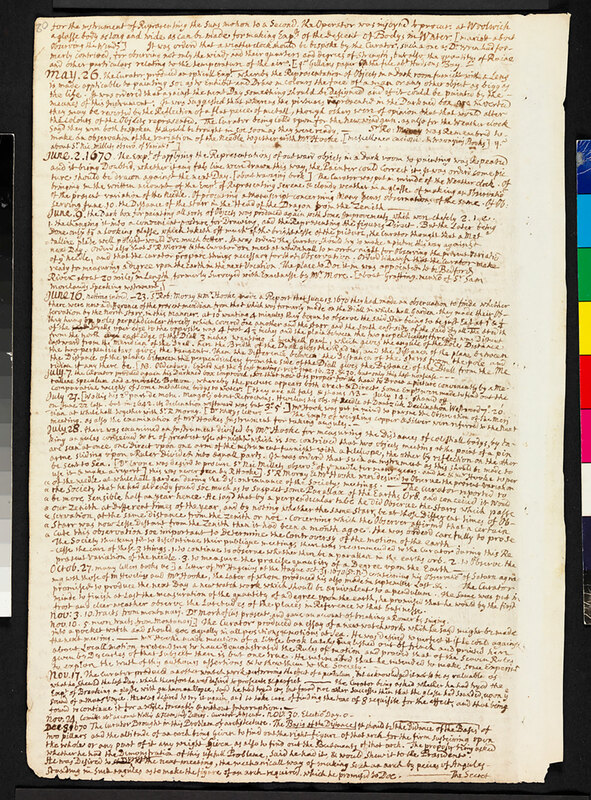 In 2006, Hooke’s very own notes concerning the minutes of the Royal Society meetings for the years 1661 to 1682 turned up in cupboard during a house valuation in Hampshire, in the south of England. But whatever happened to the minutes of the Royal Society meeting where Hooke first demonstrated the concentric balance spring? Their absence appears to be Hooke’s own fault. As Hooke’s paranoia about his ideas being stolen grew ever more acute, he took to copying Oldenburg’s minutes for the Royal Society meetings. The irony lies in the fact that Hooke removed Oldenburg’s draft of the minutes and stuck it in his own notes. Oldenburg then failed to record Hooke’s demonstration in the official minutes, thus obscuring Hooke’s demonstration of the balance spring until Hooke’s own notes were discovered. Hooke, in a typical irascible tirade, vented his frustration at the slowness of Tompion in correcting problems with the prototype watch, branding Tompion a “clownish churlish dog” and a “slug”, according to Thomas Tompion, His Life and Work, a 1951 biography of the clockmaker. Mr McEvoy also notes that there is an interesting parallel, as Huygens also had trouble with his watchmaker in Paris, Isaac Thuret: “Having made the first working sprung balance, and having taken a vow of secrecy, Thuret went behind Huygens’s back and attempted to apply for a patent in his own name.” Skulduggery was as much a part of science in the 17thcentury as reasoned experimental enquiry it seems. The long lost notes, now known as the Hooke Folio, were initially slated to go under the hammer at Bonhams and expected to fetch some £1m. 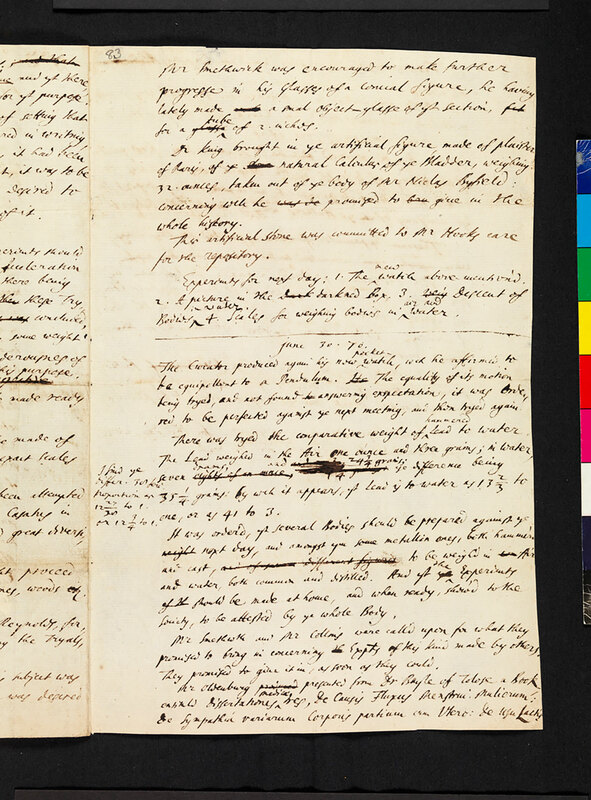 But an eleventh hour deal, funded by private donations, allowed the Royal Society to buy the folio for £940,000, or about US$1.2m, and archive the notes alongside other documents from the period. Below, in print for the first time, and with the kind permission of the Royal Society, is an all-important page out of the Hooke Folio. The Hooke Folio restores Robert Hooke’s place in the development of the balance spring. He was indeed the first to execute the idea and demonstrate that such an invention could work, forming the foundations of the portable and precise chronometers that were to come, the very same watches that helped England rule the waves, and build an empire. At the same time, it makes one ponder the accusations made by Hooke about Newton and other scientific foes. Robert Hooke finally gets the credit he deserves, even if it was 300 years too late.